This article is in conjunction with the article ‘Introduction to Google Analytics Library – analytics.js’ and ‘Introduction to Google Analytics Commands’. 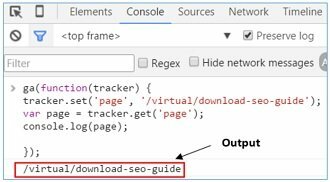 If you want to send data to multiple web properties from a single web page then you need to understand what trackers are and how they can be created and used. Trackers are commonly used for roll up reporting (reporting of data in aggregate form, from multiple websites/mobile apps) and for implementing cross domain tracking. Without first creating and using a tracking object, you can not send hit data to a GA property. Google Analytics ‘create’ command is used to create a tracking object. This command also associate the tracking object with a web property. #1 Tracking id (also known as property id). You can set tracking id by using the trackingId field object. This field object accept values of type text. Note(1): I use and recommend field names, to make the code easier to understand and debug. Note(2):You have to supply tracking id whenever you use the ‘create’ command method. #2 Tracker name – it is the name of the tracking object. The name of the default tracker is ‘t0’. You set tracker name only when you are using a non default tracker. The name field accept values of type text. #3 Client id – it is a unique random number which is created and assigned by google analytics cookie _ga. This id is used to uniquely identify a user. The clientId field accept values of type text. There are two types of tracking objects: default and user defined tracking objects. But we do not refer to default tracker by this name. To refer to a default tracker, just don’t use any tracker name. Note: Google refers to user defined trackers as named trackers. So named trackers and user defined trackers are same thing. Each tracking object can send data to only a single GA property. Similarly, if you want to send website usage data to 3 web properties (3 websites/apps) from a single web page then you need to create and use 3 trackers. 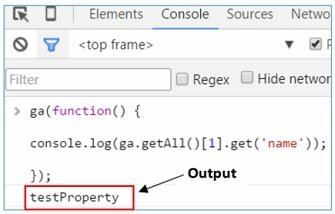 Here ‘WebProperty2’ is the name of the second tracking object. I selected this name for easy reference. You can name the tracking object whatever you want. 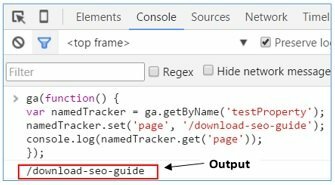 When you are using multiple trackers on a web page, you would need to prefix Google Analytics command (like ‘send’, ‘require’, ‘linker’ etc) you use with the tracker name. Otherwise you won’t be able to send hit data to the second web property via the user defined tracker. ga(‘WebProperty2.require’, ‘linker’); // load the auto link plugin for the second web property. ga(‘WebProperty2.send’, ‘pageview’); // send pageview data to second web property. 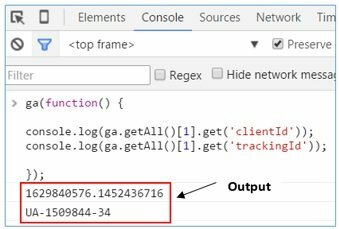 To retrieve data stored on default tracker, we use the get method in a ready callback function. Callback function is simply a function which is passed as an argument to another function. The ga() command queue function can accept another function as an argument. This function executes once the anaytics.js library has fully loaded. 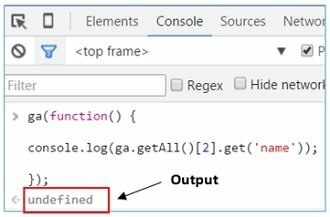 Use hit callback function when you want to make sure that a hit is being fired. Use ready callback function to retrieve default tracker data. This function is called after a default tracker has been created. The default tracker is passed as the first and only argument to this function. This argument is ‘undefined’ if no default tracker has been created. If you are not using a default tracker or if you are using multiple trackers on a page, then you can retrieve data from user defined tracker by using getByName and getAll methods in a ready callback function. You need to use the ready callback function because ga object methods (like getByName and getAll) are only available when analytics.js has fully loaded and ready, so you need to reference them inside a ready callback function. Note: you can’t use get method directly on a user defined tracker (also known as named tracker). To retrieve the name and other data of user defined tracker, you need to use either the getByName method or getAll method. This method is used to get an array of all created trackers. The ga.getAll() array element refers to the default tracker. The output of this code would be: ‘t0’ which is the name of the default tracker. You can update the default tracker data by using the set command method in the ga() command queue function or by using the set method on the default tracker itself. Here, page is the path portion of the url whose value start with forward slash ‘/’. Google Analytics refer the user defined tracker as named tracker. You can update the named tracker data by using the set command method in the ga() command queue function or by using the set method on the named tracker itself. You can send data via the default tracker data by using the set command method in the ga() command queue function or by using the send method on the default tracker itself. You can send data via the named tracker data by using the set command method in the ga() command queue function or by using the send method on the named tracker itself. Let us use the concept of trackers to solve real work life problem. Let us suppose you are using multiple trackers for roll up reporting and you need to implement cross domain tracking on top of that. Now how you will do that? Before I start, let us do a quick recap of roll up property. In Google Analytics, a website or mobile application is called a property (also known as web property or digital property). 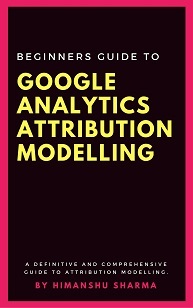 Unless you are marketing agency/consultant, you are most likely have access to only one Google Analytics account and only one Web property. 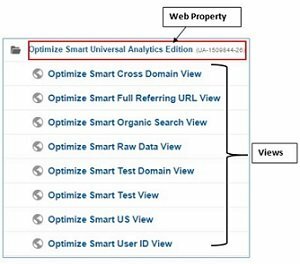 In Google Analytics each property is identified by a unique ID known as property ID (or tracking ID). A roll up property is the web property whose hit data comes from other Google Analytics properties. These other properties are known as ‘Source Properties‘ in Google Analytics lingo. For example in the chart above, property-1, property-2 and property-N are source properties. Since each property in Google Analytics represents a website/mobile application, a roll up property contains data from multiple websites/mobile applications. Just like any other property in GA, a roll up property can also contain one or more views. These roll up views contain multiple reports. The reports contain hit data from two or more websites/apps. So if you own multiple websites or treat your sub domains as different websites then roll up property could be useful for you. 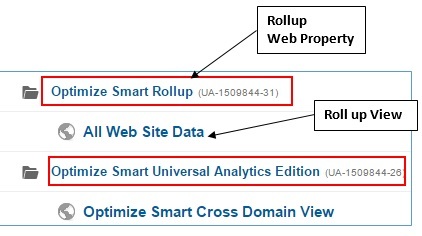 Note: To learn more about roll up properties, checkout this article: Implementing rollup reporting in Google Analytics. What we are going to do here, is use two tracking objects for each web property. So in the case of abc.com, the first tracking object (or default tracking object) is used to send hit data to abc.com. The second tracking object is used to share abc.com hit data with the rollup property. Similarly, in case of xyz.com the first tracking object (or default tracking object) is used to send hit data to xyz.com. The second tracking object is used to share xyz.com hit data with the rollup property. At the same time we will also implement cross domain tracking between abc.com and xyz.com, so that we can track users’ activities across domains. This rollup property will store hit data from both abc.com and xyz.com websites. For this to happen, both websites abc.com and xyz.com has to share all of its hit data with the rollup property. If you don’t use rollup property and simply share abc.com and xyz.com hit data with each other by using multiple trackers then both websites’ web property will contain data from two websites and thus make individual analysis of the websites very difficult. You need this filter so that you can separate the traffic coming from two different websites in your rollup reports. Now in order to share abc.com hit data with the rollup property, you need to create a new tracker in the GA tracking code of abc.com and use the new tracker to send hit data to rollup web property. Now in order to share xyz.com hit data with the rollup property, you need to create a new tracker in the UA tracking code of xyz.com and use the new tracker to send hit data to rollup web property. # Create a copy of the main view of the website abc.com. Name the new view ‘ABC Cross Domain Tracking View’. We have created this view in order to maintain one unfiltered view. # Apply custom advanced filter to the new view which add host name (domain name) to the request URI. # Add ‘abc.com’ in the referral exclusion list to avoid self referral issues. # Create a copy of the main view of the website xyz.com. Name the new view ‘XYZ Cross Domain Tracking View’. 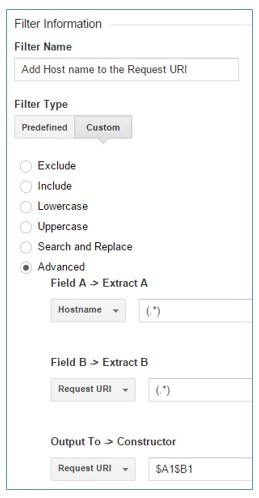 # Apply custom advanced filter to the new view which add host name to the request URI. # Add ‘xyz.com’ in the ‘referral exclusion’ list to avoid self referral issues. The auto link plugin is used to track cross domain traffic in Google Analytics. Google recommends implementing cross domain tracking via this plugin. In order to use this plugin you need to modify the GA tracking code of both websites abc.com and xyz.com.